Steps are a crucial part to your Home Business or Work-at-Home success. You must come to understand that there are many stepping stones on your journey to achieving success working from home and/or growing a Home Based Business. We often wonder when we start where we should begin, what to do, how to market and promote and ofcourse why it is so darn overwhelming sometimes. This is very normal to wonder as you have just taken one of the biggest steps in your life and made one of the most important choices of your life. What the realization of what your work-at-home success entails is that we must not focus so much on the How To but more on the I Know part. This might seem like a weird way of putting the pieces of the puzzle together but it is the right way. When we put aside so much the How To and focus on the fact that I Know I will make this happen, I Know I will achieve my goals, I Know that success will come... the How To sort of ends up in our laps. Yes, you must take the steps of working the How To's, the Tasks, the hard, focused time on marketing and promoting but keep in mind that sometimes one thing will lead to another as long as we believe in the I Know. 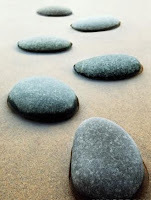 There are different stepping stones you will go through as you strive for success. Different phases, learning curves, hardships, obstacles and walls that are there for a purpose. Letting these stepping stones teach you and grow you as a Person, a Leader and an Entrepreneur will allow success to fall into place. Allowing these things to come and learning how to overcome them, learn and grow from them are ultimately the reason you will achieve your goals. Take it one step at a time and remember you will not know every little detail needed right away. You must be willing to take a deep breathe, hold on tight and fight through the obstacles. Start on one aspect of your Home Business/Opportunity then move on to the next one. Once you have that one down then go on to learning more and making them a part of your schedule and routine. For example... say you just finished your training about the products or services, what the company is about and how to conduct a presentation, read a script or share a recorded call. Okay, so you have the basics but where do you start right? Next you would want to learn one way to market your business, read and train about it, start working it and then get in a routine daily working that task to where it is just part of your everyday schedule. As time goes you will add in more ways and stay on a consistent routine of marketing and promoting your Home Business or Work-at-Home Opportunity. Once you feel you have a certain amount of marketing tasks going on a daily basis you will then be ready to open up to more ways. Stay open minded, determined and focused. Most of all don't allow the obstacles to stop you. Face them, find a solution then move on towards your goals.